DALLAS, TX – March 27, 2019: On Monday, April 22, Texas television legend Bobbie Wygant will be at The Sixth Floor Museum at Dealey Plaza to share insights and memories from her seven-decade career in broadcasting, including her experience broadcasting live on November 22, 1963, as news broke of the assassination of President John F. Kennedy. The second in a series of media-related public programs, “70 Years of Texas Television: An Evening with Bobbie Wygant” is being presented in conjunction with “55 Years,” a temporary exhibit that showcases how the media portrayed President Kennedy on magazine covers from immediately after his death in 1963 through 2018. Wygant joined Fort Worth-based WBAP-TV, the first television station west of the Mississippi, in 1948 two weeks before it went on the air. The first female in the southwest to be host/producer of a general-interest television interview program, she interviewed thousands of celebrities from Bette Davis to Charley Pride to Bradley Cooper. Her popular midday program “Dateline” was live on the air when President Kennedy was assassinated. Wygant is the author of “Talking to the Stars.” Pre-signed books will be available for purchase at the program. Tickets to “70 Years of Texas Television: An Evening with Bobbie Wygant” are $20 and include a reception, program, complimentary parking and a private viewing of the “55 Years” exhibit. The reception begins at 6 p.m., followed by the program at 7 p.m. Tickets are available at jfk.org. Emmy award-winner Bobbie Wygant was the first Texas broadcaster and the sixteenth in the nation to be inducted into the prestigious Gold Circle of the National Academy of Television Arts and Sciences. When she joined WBAP-TV/Channel 5 (now KXAS-TV), she initially served a multitude of roles at the station, from being a staff writer to appearing in live commercials. But soon her talent for delivering captivating interviews with entertainers and celebrities became apparent. Known for her integrity and authenticity, she is credited by broadcasters such as Scott Pelley of CBS News’ “60 Minutes” and Bob Schieffer, former host of CBS News’ “Face the Nation” with setting the standards for generations of younger journalists who followed her. Mission Statement: The Sixth Floor Museum at Dealey Plaza chronicles the assassination and legacy of President John F. Kennedy; interprets the Dealey Plaza National Historic Landmark District and the John F. Kennedy Memorial Plaza; and presents contemporary culture within the context of presidential history. Vision Statement: To be an impartial, multi-generational destination and forum for exploring the memory and effects of the events surrounding the assassination of President Kennedy, through sharing his legacy and its impact on an ever-changing global society. Located at 411 Elm Street in downtown Dallas, the Museum is open Monday 12 p.m. to 6 p.m. and Tuesday – Sunday 10 a.m. to 6 p.m. Audio guides for the permanent exhibit are included with admission and available in eight languages, including ASL. For more information, visit jfk.org or call 214.747.6660. Admission: $18 Adult, $16 Senior, $14 Youth (children aged 5 and under are free or $5 with audio/ASL). DALLAS, TX – January 29, 2019: On Monday, February 18, The Sixth Floor Museum at Dealey Plaza will mark its thirtieth anniversary by presenting the premiere of a commissioned work by Texas composer Jesus Martinez. Entitled “The Sixth Floor,” the work pays tribute to the Museum’s early beginnings as well as honoring the life, death and legacy of President John F. Kennedy, who was assassinated fifty-five years ago. A Texas native who had not yet been born at the time of the assassination, acclaimed composer Jesus Martinez had an inherited understanding of the impact of the death of President Kennedy. While creating the composition “The Sixth Floor,” he gained deeper insight into why his generation and those even younger remain connected to Kennedy’s legacy as a symbol of unbridled passion for truth, perseverance and patriotism. Arranged in three movements, “Sniper’s Perch,” “A Nation in Crisis” and “The Legacy,” Martinez’s composition is a stirring journey from the darkest days of 1963 to a deeper understanding of the enduring relevance of President Kennedy, and a call to imagine what lies beyond. The composition will be performed by The Julius Quartet, which currently serves as the Peak Fellowship Ensemble-in-Residence at the Meadows School of the Arts at Southern Methodist University. The quartet debuted at Carnegie Hall in 2016 and is rapidly becoming known for both its musical talents and work with outreach events and educational workshops for at-risk youth. The 30th Anniversary Concert will be held on Presidents Day, Monday, February 18. A pre-concert reception begins at 6 p.m., followed by the program at 7 p.m. Tickets are $30, and are available for advance purchase at jfk.org. Concert attendees will also be able to tour the Museum’s temporary exhibit, 55 Years, on display on the seventh floor through August 4, 2019. The installation includes 57 magazine covers depicting President Kennedy from 1963 to 2018 and reflects how the memorialization of the thirty-fifth president has evolved over time. With a master’s degree in Music Composition from Southern Methodist University and a bachelor’s degree in Music Education from University of Texas at Arlington, Jesus Martinez has served as Composer-in-Residence for both the Alabama Orchestra Association and the Irving Symphony Orchestra. While at SMU, he studied primarily with composer Dr. Robert Frank and developed a special interest in film scoring and new music ensembles. Martinez was commissioned to score the film “Mystery of Birds,” which premiered in Houston in 2011 and was selected to screen at the Los Angeles Black Film Festival. In 2012, the film won the African Movie Academy Award for Best Film by an African Living Abroad. Also in 2011, Martinez presented his 34-minute world premiere of “Threnody for 9/11 for Mixed Chamber Ensemble,” which received accolades in Texas print and broadcast media and a resolution in his name issued by the Texas State Legislature. Martinez scored the 2013 film “Take the Spotlight,” which premiered at four film festivals in Texas, Arkansas and Georgia, winning awards for best film and best director. His other noteworthy works include “American Dances” with the SMU Dance Studio, “Revelations” with Dr. Michael Varner, “All the Wrong Friends” with Mark Kerins and “The Hanging Tree,” which received an Honorable Mention in the 2015 Earshot Columbus Symphony Orchestra Composer Competition. Hailed as “the captivating young string quartet” (The Bennington Banner), the Julius Quartet is rapidly making itself known in the chamber music world. As the Graduate Quartet-in-Residence at the John J. Cali School of Music at Montclair State University, the musicians worked intensely with the celebrated Shanghai Quartet and went on to hold a special residency as “The Boston Conservatory’s Honors String Quartet.” The quartet was awarded First Prize at the Chamber Music Yellow Springs Competition, First Prize at the first annual MA-ASTA String Quartet/Quintet Competition by unanimous vote and was nominated for the Harvard Musical Association’s Arthur Foote Award. The Julius Quartet has performed in Bing Concert Hall (Stanford, CA), Bargemusic (Brooklyn, NYC), the Shalin Liu Performing Arts Center (Rockport, MA), The Moss Arts Center (Blacksburg, VA), the Museum of Fine Arts (Boston, MA) and the Isabella Stewart Gardner Museum (Boston, MA). In addition, the group has been featured repeatedly in the Music from Salem festival, where it collaborated with artists and directors Rhonda Rider, Lila Brown and Judith Gordon. The quartet includes violinists Hyun Jeong Helen Lee and David Do, violist John Batchelder, and cellist Brooke Scholl. DALLAS, TX – September 26, 2018: The Sixth Floor Museum at Dealey Plaza is presenting an unprecedented event on Monday, October 29. Conflicting Conclusions: The Government Assassination Investigations will provide unique firsthand insights into the Warren Commission (1964) and the U.S. House Select Committee on Assassinations (1979) reports, the two key government investigations into the November 22, 1963 assassination of President John F. Kennedy. The Museum is honored to host a conversation between Howard P. Willens, Assistant Counsel on the staff of the Warren Commission, and G. Robert Blakey, Chief Counsel and Staff Director for the U.S. House Select Committee on Assassinations. The October 29 program will mark the first time these two highly respected members of the legal profession will sit down together to publicly discuss the context of these investigations which were conducted 15 years apart, including their findings and why questions remain still today. One week after the November 22, 1963 assassination of President John F. Kennedy, President Lyndon B. Johnson established The President’s Commission on the Assassination of President Kennedy. Chaired by Chief Justice Earl Warren, this prestigious investigative body, commonly known as the Warren Commission, presented its Final Report to President Johnson on September 24, 1964, concluding that Lee Harvey Oswald acted alone and finding no evidence of a conspiracy. Following a wave of critical literature by independent researchers about the assassination investigation, amplified by the skepticism and social unrest of the 1960s and the Watergate scandal in the early 1970s, public trust in the Warren Commission Report significantly dropped. Conflicting Conclusions: The Government Assassination Investigations will be held at 7 p.m. on Monday, October 29 on the Museum’s seventh floor. Program tickets are $25, and are available for advance purchase at jfk.org. An attorney in the Criminal Division of the U.S. Justice Department in 1963, Howard P. Willens served as Assistant Counsel on the staff of the Warren Commission. He is the author of History Will Prove Us Right: Inside the Warren Commission Report on the Assassination of John F. Kennedy (2013). A longtime law professor at Notre Dame and Cornell Law School, G. Robert Blakey was appointed Chief Counsel and Staff Director to the U.S. House Select Committee on Assassinations from 1977 to 1979. He is co-author of The Plot to Kill President Kennedy (1981). Admission: $16 Adult, $14 Senior, $13 Youth (children aged 5 and under are free). 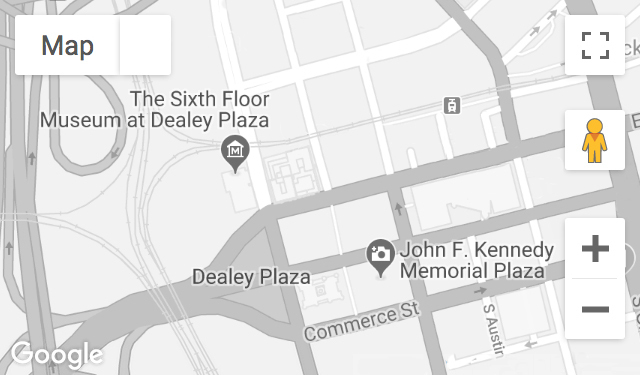 The Sixth Floor Museum at Dealey Plaza Announces Special Exhibit on Robert F. Kennedy and Martin Luther King Jr.
DALLAS, TX – May 23, 2018: The Sixth Floor Museum at Dealey Plaza will open a special temporary exhibit, Rebel Spirits: Robert F. Kennedy and Martin Luther King Jr., on Tuesday, June 5, 2018, the fiftieth anniversary of the assassination of Senator Robert F. Kennedy. The exhibition will close on Labor Day, September 3, 2018. Over the course of five years, beginning with the 1963 death of President John F. Kennedy, three of the most important American leaders of the twentieth century were assassinated. This year marks fifty years since the assassinations of Dr. Martin Luther King Jr. and Senator Robert F. Kennedy, who died within two months of each other in the spring of 1968. Rebel Spirits: Robert F. Kennedy and Martin Luther King Jr. showcases approximately 60 photographs that uncover the relationship between these historic figures, supplemented by a selection of artifacts from the Museum’s collections. Robert F. Kennedy (November 20, 1925 – June 6, 1968) and Martin Luther King Jr. (January 15, 1929 – April 4, 1968) were born worlds apart—culturally, geographically, racially, financially and politically—but by the time they were killed within months of each another in 1968, their worlds had come together. As their respective concerns expanded beyond civil rights and organized crime, their ties deepened to encompass shared interests in supporting the poor and opposing the war in Vietnam. This unprecedented exhibition explores the overlapping paths of their lives through images taken by some of the most renowned photojournalists of the era, including Bob Adelman, Danny Lyon, Henri Dauman, Jacques Lowe, Spider Martin, Steve Schapiro, Lawrence Schiller and Paul Schutzer. Exhibition highlights include images of King and his son looking at the charred remains of a cross the Ku Klux Klan burned outside his Atlanta home in 1960, King’s mug shot after being indicted for the 1956 Montgomery Bus Boycott and Kennedy being swarmed by an adoring crowd during his 1968 presidential campaign. The temporary exhibit will be located on the seventh floor of the Museum and is included with general admission. Rebel Spirits: Robert F. Kennedy and Martin Luther King Jr. is based in part on the book The Promise and the Dream by David Margolick, published on April 4, 2018 by RosettaBooks. In conjunction with Rebel Spirits, the Museum will offer a special public program at 7 p.m. on Monday, June 4, 2018, featuring a conversation with photojournalist/exhibit curator Lawrence Schiller and journalist/author David Margolick. A limited number of interview time slots are available with Schiller and/or Margolick during the day on Monday, June 4. Advance notice is required; to request an interview, contact Laurie Ivy lauriei@jfk.org or 214-389-3046. Rebel Spirits: Robert F. Kennedy and Martin Luther King Jr. was produced by Wiener Schiller Productions and is presented locally by The Sixth Floor Museum at Dealey Plaza. The exhibition was curated by Lawrence Schiller with support from Getty Images. An accomplished journalist and photographer, Lawrence Schiller has documented major stories around the globe for Life, Look, Newsweek, Time and others. As an official photographer on the Robert F. Kennedy presidential campaign staff, Schiller captured iconic images of Senator Kennedy during the months prior to his assassination. Schiller also photographed Lee Harvey Oswald in Dallas in November 1963 and collaborated with Norman Mailer for nearly 35 years. A longtime contributing editor at Vanity Fair and a former editor at the New York Times, David Margolick writes about culture, the media and politics. Rebel Spirits: Robert F. Kennedy and Martin Luther King Jr. was inspired in part by Margolick’s newest book The Promise and the Dream, which was released on April 4, 2018, the fiftieth anniversary of the assassination of Dr. Martin Luther King Jr. The book is available in the Museum’s bookstore and online at jfk.org. Admission: $16 Adult, $14 Senior, $13 Youth (children aged 5 and under are free). Entrance to Rebel Spirits is included with Museum admission.